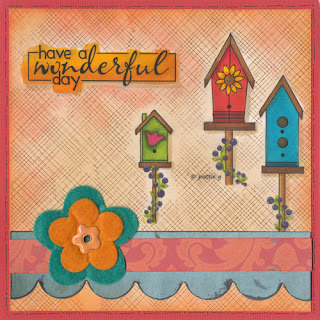 Det er fredag og dermed en ny konkurrence på bloggen - Pattie's Creations Desing Challenge - Flowers OR Flowers and Pearls - Challenge #18 - til mit DT job har jeg brugt digistamp 'Three Birdhouses' fra Pattie's Creations, Hero Arts baggrundsstempel; Florentine Pattern/Evenlope Pattern, text freebie fra Create with TLC, ink og blomster punch fra EK Success. Jeg hyggede mig med at farvelægge og "maske" fuglehusene, men især at bruge mine ny baggrundsstempler, så det blev til 2 kort. "jac-inks" Papercraft Challenge #4 - TECHNIQUE CHALLENGE - MASKING the birdhouses are masked before I used the background stamp. The Creative Cottage challenge blog - # 35...Spring Has Sprung! wow, these are both so cute, luv the flowers....have a fabulous weekend! Linda - both gorgeous creations! 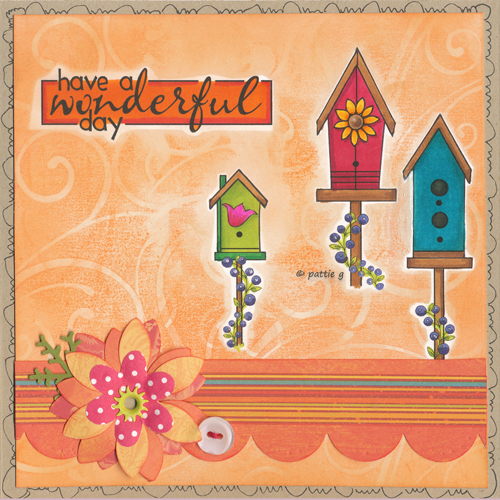 Love your coloring of the birdhouses image. wow hvor ser det godt ud! Dejlige friske sommerfarver skønt! Hvor er de bare flotte!!! This is such a clever use of masking - simple yet effective. Thanks for joining us at jac-inks challenges Linda, I love the layout of this card and the colour combination is lovely. Both cards are so nice Linda & I really like the colours you've chosen.